Are Wales ready for action? 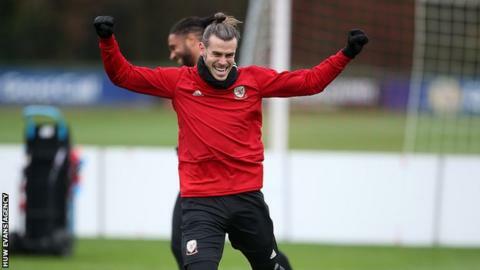 "Gareth got his first 90 minutes in three months [for Real Madrid last weekend], took part in a little bit of training yesterday, then trained this morning, really well. "So it was just too much of a risk with Sunday in mind. That was the case with a few of the players. I gave the chance for players to push forward for Sunday, but also keeping players fresh." Arsenal's Aaron Ramsey missed the game with a thigh problem and Bournemouth's David Brooks was absent with an ankle knock, with Harry Wilson and Connor Roberts left on the bench. Giggs said: "Originally when I planned the game, it was going to be a first-half [at full strength] and then we make changes. "But Brooksy took a knock at the weekend on his ankle, Harry has played a lot of games, Connor has played a lot of games. Aaron picked up that little knock. It gave me the opportunity to look after them at the start of the week." Wales had an escape in the second half when Chris Gunter cleared off the line from Trinidad and Tobago's Aubrey David. But they improved and eventually forced a winning goal two minutes into added time as Ben Woodburn chested the ball in from close range. "We had a couple of days to work on a few things and felt we did that in the first half without that final third composure, without making the right decisions and having a bit of quality. "Trinidad and Tobago didn't have anything. But I reminded the players at half-time about Albania [where Wales lost in November]. It was exactly the same in Albania, so we had to keep that clean sheet. "We rode our luck a bit in the second half. Obviously Gunts made a fantastic clearance off the line. Credit to Trinidad and Tobago, in the second half they made it difficult for us. We just had to be patient. "To score late in the game is a great trait for teams to have, so I'm really pleased with the result."